Burma, now known as Myanmar, first became a British colony in the early 19th century and would remain so for over 100 years. Throughout this period, many magnificent buildings would be built in the country’s largest city of Yangon, resulting in an interesting hybrid of European and Buddhist architecture. Yangon, in fact, remains one of the best places in the world to see preserved colonial buildings, most of which were constructed in the early 1900’s. 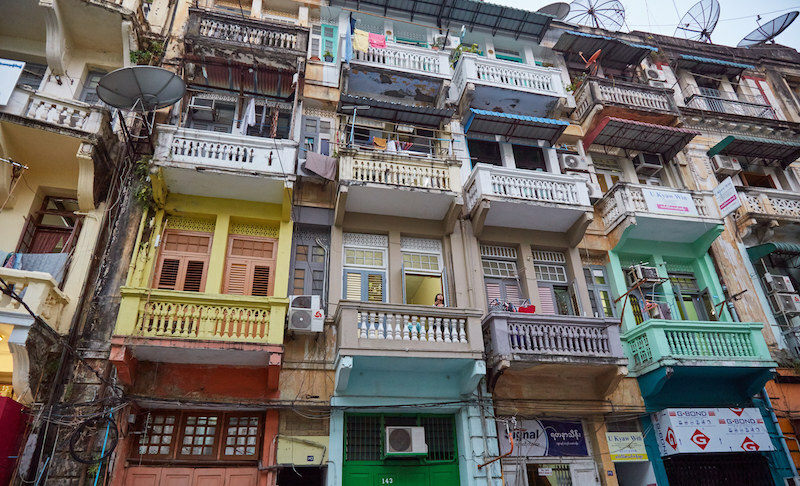 Some are concerned, however, that Yangon’s colonial architecture is in danger of being replaced by newer developments in the not-too-distant future. Today, one of the organizations working to preserve the city’s colonial buildings is the Yangon Heritage Trust. One of their main activities is organizing walking tours for both locals and foreign tourists, hoping to educate and raise awareness about the city’s rich history. After all, once these buildings are gone, they’re never going to come back. But what exactly are the threats facing these cherished structures? I had the opportunity to take part in one of the YHT’s city walking tours to learn more. 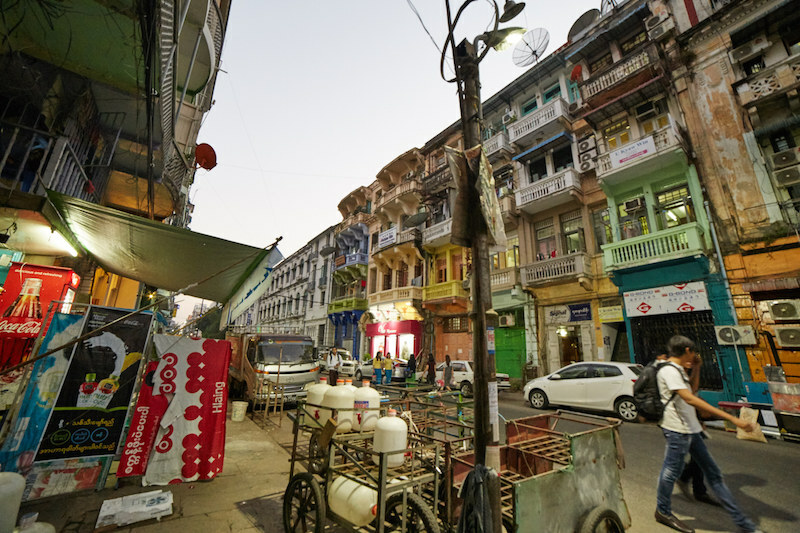 An estimated 200 or so colonial buildings remain in Yangon, most of which exist within a single square mile. Though this may seem like a lot, these buildings are disappearing fast, explained our guide Su. The government does little to actively protect the buildings, although there are some laws in place which prohibit their destruction. Unless, of course, the buildings end up in a major state of dilapidation, in which case the government may approve demolition. “Maintaining these old buildings is expensive and as time goes on they require even more maintenance,” said Su. “The land prices in Yangon keep rising so many of the buildings’ owners purposely let them decay. Then they can eventually sell the land to a high-rise developer.” Unfortunately for the current inhabitants of these colonial buildings, any complaints to their landlords are likely to fall on deaf ears. Myanmar has only been under civilian for a short time, meaning Yangon is seen as some kind of new frontier for foreign investors and developers. And the city’s skyline has already been transformed somewhat as a result. Further initiatives from these foreign firms, especially those from China and Japan, may result in Yangon losing the colonial charm which differentiates it from other Southeast Asian capitals. The walking tour organized by the Yangon Heritage Trust takes place over a couple of hours in the city’s business district. The buildings mentioned below are just some of the many colonial buildings you can still spot in Yangon. If you decide to take a tour with YHT, then you will start at their office on Pansodan Street. Even if you go it alone, this would still be a good area to start. Many of the notable buildings are located on Merchant Road, Pansodan St. or Strand Rd. All of the buildings featured below are relatively close to one another, so check the maps to find your way around. This building was constructed in 1928 by architect Thomas Oliphant Foster. The British felt a port authority was necessary after Rangoon became what was one of the major Asian ports of the British Empire at the time. The tower happens to be reminiscent of many the bell towers found throughout Italy. Constructed in 1933, this building was originally the headquarters of the Irrawaddy Flotilla Company founded by Scottish Merchants. Myanmar's Inland Water Transport Ministry has been facing major financial difficulties in recent years, meaning it's possible that the building could change owners yet again sometime in the future. Constructed in 1932, the Rander House was originally occupied by merchants from the town of Rander, Gujarat. It later housed the embassy of Pakistan. The building was constructed in an art deco style that was popular in 1920's Europe. Today the building is managed by the Myanmar tax authorities. The Lokanat Building was constructed in 1906 by the Sofaer Family, one of Burma’s prominent Jewish immigrant families. It was once considered to be the premier building in Yangon in which to operate a business. Lokanat was once home to all sorts of international firms which sold a wide variety of imported goods. Today, visitors to the building can find a guest house, an art gallery and what appears to be the offices of an IT company. One peculiar room was an empty office with a 1990’s era Compaq computer displayed prominently in one of its corners. The Lokanat Building has clearly seen better days, but it still makes for a fascinating visit. Many parts of the building today both look and feel abandoned, but oftentimes you will walk down a dark, empty corridor only to come face to face with a crowded office or workshop. Located on Pansodan Street, this 1930 building was originally the home of the National Bank of India. It then became Grindlay's Bank Building in the 1940's. After Burmese independence, it functioned as a museum for a short time but has been occupied by the Myanmar Agricultural Bank since 1996. This red-bricked building constructed in 1908 was originally home to yet another Scottish firm, the Bulloch Brothers & Co. The Glasgow company specialized in rice milling and shipbuilding. After a number of years as the British India Office, today this Strand Road building now operates as the Yangon General Post Office. Originally constructed in 1862, this is the oldest surviving church of Yangon. Aside from the British, the Armenians were another European group to have a large influence over colonial Burma. In fact, the Armenians even ran one of Yangon’s most famous hotels, the Strand. The Armenians who came to Burma were descendants of those who fled the Ottoman Empire in the late 1600’s. A little over 1,000 Armenians lived in British India by the late 1800’s, of which Rangoon used to be a part. 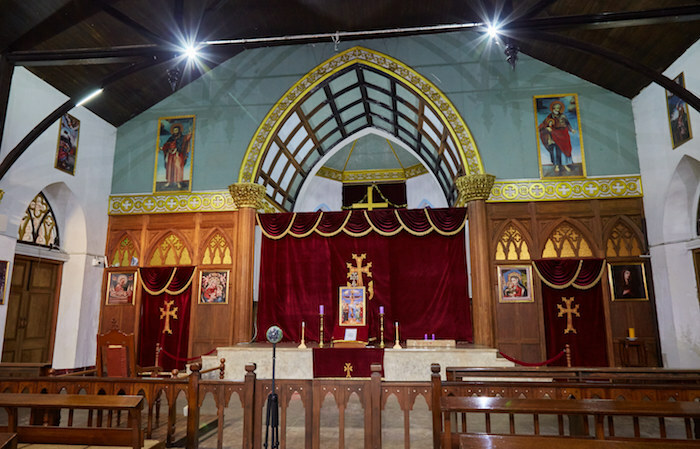 The small community was close with Burmese royalty and the land on which the church now stands was even gifted to them by the former Burmese king. Only a handful of Armenians remain in modern-day Yangon, but more and more tourists are taking an interest in this well-kept building and its traditional gothic architecture. Located on the corner of Merchant and Bo Aung Kyaw streets, this building was originally the headquarters of 'The Rangoon Times' before becoming home to the Mahatma Gandhi Memorial Trust from 1951. The National League for Democracy officially declared it as 'Gandhi Hall' during the 1990 national elections. Today this building is in noticeably poor condition. Originally built in the 1800's, this Victorian-style building used to be the home of British Burma in Yangon. This is also the site of Burmese independence leader Bogyoke Aung San's assassination on July 9th, 1947. Normally closed to the public except on Marty's Day, the building is currently being converted into a museum, and not a hotel as originally planned. Located just by Sule Pagoda, Yangon City Hall is a mix between British colonial and traditional Burmese architecture. The construction of this building lasted from 1926 until completion in 1936. The building was the site of many demonstrations against Burmese military rule, not to mention a few bombings within the last couple of decades. This narrow, relatively quiet street is one of the few on which nearly all the colonial style architecture remains. It’s also known for being the residence of famous Chilean poet Pablo Neruda during his years as a diplomat. This is where he wrote what are considered by many to be some of his best poems. The poems largely focus on his relationship with his Burmese lover known as “Josie Bliss,” whom Neruda often described as being an intensely jealous woman. She even surprised him at his new residence in Sri Lanka once his stint in Burma was over! Myanmar, a long-time isolated nation, was off the average traveler’s radar for decades. The country is only just now beginning to see a tourism boom. Along with Shwedagon Pagoda, Myanmar’s most important temple, Yangon’s colonial architecture is one of the city’s main tourist attractions. If tourism continues to increase in the near future, there’s a possibility that local authorities and individual building owners may start to see some financial incentive for keeping these buildings intact. The Yangon Heritage Trust was only founded recently in 2012, in urgent response to the city’s changing landscape. The organization does not want to put a halt to new development, but for modern constructions to coexist with preserved and restored colonial buildings. Its goal is to turn Yangon into one of Asia’s “most livable cities.” For the sake of both foreign visitors and local residents alike, let’s hope that the YHT’s vision can come true before it’s too late. The colonial architecture walking tours organized by the Yangon Heritage Trust can be booked online through their web site. Tours cost around $30 USD and payments are made in person at their office. From April until the end of August 2017, the YHT is not offering their regular tour program. Other, more expensive tour options exist, but you could always try a free walking tour of your own. Hopefully the information provided in this article can help. Yangon is not an incredibly large city and it also lacks a public transportation system. Therefore, regardless of where you’re staying, it should be easy to take a taxi to the downtown area where most of the colonial architecture is located. Of course, one of the city’s best known colonial buildings, The Strand, is a five-star hotel. If that’s beyond your budget, there are plenty of other options in the city. I stayed on Yaw Min Gyi St., near the Yangon Central Railway Station. This was an easy taxi ride from downtown and there were also plenty of other sites within walking distance.